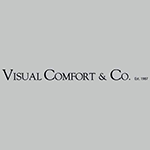 Visual Comfort produces classic, affordable lighting in a diverse range of styles. The American company, established in 1987, works closely with its designers – including Barbara Barry, Ralph Lauren, Suzanne Kasler, Aerin Lauder, Kelly Wearstler, and Thomas O’Brien – and manufacturing partners in Asia to refine its products, achieving an exceptional balance between value and design. O’Brien’s modern interpretation of vintage American lighting is particularly emblematic of this.